In opposition to the other-worldly name the "Orange Angel" is one the most fiendish custom motorcycles to take off or Vardenchi. Everything about this Type IV is mean and threatening, but then it has a marvel that seems as though it was cut out of material which was crazy. 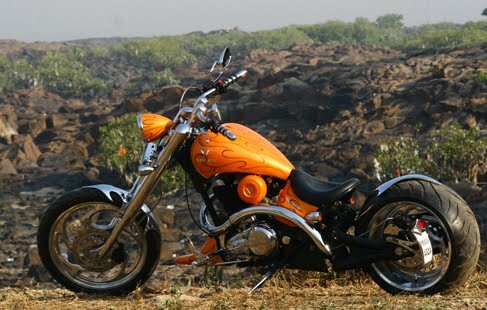 Vardenchi Orange Angel is much like a chopper but nimble to Handel. The semi wide Handel's bars and comfort foot grip positioning make you want to dart straight ahead like a war head. While the 20ltr tank allows you for quite the distance the 300mm rear tire keeps you grounded on any surface. The graphic you see is a very interesting technique where the blades reflect the shape of the blades on the fenders and they are in a matte finish. The 'krull' wheels give it the edge it needs to an overall sharp and wild design. This is one of the most crafted and creative vardenchi's on the block. 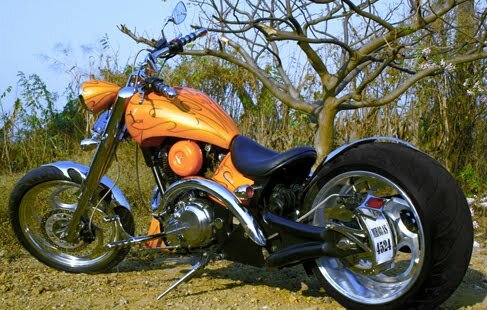 Vardenchi motorcycle was stated with the passion of seeing beautiful works of art of India! What makes a vardenchi class of its own? At vardenchi, the process of custom motorcycle building is co-creation between the company and customer. Each vardenchi is more like a work of art, rather then a hunk of hot metal and wheels. It is designed to serve to the riders individual's need. We use the Royal Enfield as base but build most of the custom parts in house some parts, like wheels and tires that can't be sourced locally, are imported. Vardenchi Motorcylces offers end to end solutions in every area of custom motorcycle building, from sheet metal fabrication, structural fabrication in house painting and assembly unit. These motorcycle are all about personality, attitude and looking great! A sincere approach to the business and perfect track record of great builds and deliveries keeps vardenchi growing consistently as we move forward. Rear suspension - Double sided swingarm with hidden double mono shocks, stroke 70mm, 3 step adjustable preload.